In honor of the 20th anniversary of Harry Potter, the “Harry Potter and the Sorcerer’s Stone” eBook is available with no waitlist or holds until Monday, Sept. 10! Harry Potter is turning 20! 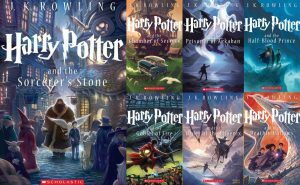 This year marks the 20th anniversary of the publication of “Harry Potter and the Sorcerer’s Stone.” To celebrate, OverDrive has made the eBook available for unlimited access until Monday, Sept. 10. The easiest way to download the eBook is through OverDrive’s app, Libby. Brush up on your spells by checking out our selection of Harry Potter books and movies! Are you a Harry Potter expert? These questions are extremely difficult. Are you up for the challenge?